While it doesn’t literally mean to kill anyone, the point is that you will write things that are so witty and smart and wonderful that you have probably lost objectivity on whether the words or phrases are useful to the reader. The only solution is to kill them! Delete. Rewrite. Either way, make sure you’re not just writing for yourself – you’re writing for the reader. I wish I had all the room in the world – or, within the pages of our bimonthly business magazine, BizVoice – to keep all my lovely darlings and every interview and nugget of information that I find fascinating when working on a story. But we have so many great stories to tell about the people and companies making Indiana a special place to work and live that I want to share as much of that with our readers as possible. 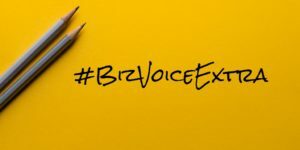 In an effort to tell more of those stories that didn’t get into the magazine, I’m starting a new series here on our blog (and this social media manager is giving it a hashtag, of course): #BizVoiceExtra. While it’s not a total workaround of “killing my darlings,” this means I can expand on some topics that readers also might find interesting. Look here for stories and photos you won’t find in BizVoice from me and hopefully my fellow writers (they don’t know I’m going to rope them into this yet, ha!). Our March-April edition of BizVoice drops this week! Keep an eye out for some intriguing stories focusing on education and workforce, Indiana Vision 2025 progress and a trip through Indiana’s political history with another entry in our yearlong Road Trip Treasures series. I’ll have a few of the #BizVoiceExtra stories from our new edition in a few days. Check back soon!